Put your confidence in a service in Brockley with a rating of over 96%! Q: How is your window cleaning Brockley going to renew the transparency of my sills? In-house window cleaning – The technicians will wash grime with ladders and sponges. Q: Can you wash my panes during bad weather? A: If you spot gloomy clouds on the day of your booking, don't be alarmed. The window cleaners in Brockley can still do the service as long as they're facing a light drizzle. However, in the event of a cloudburst, we will kindly ask you to reschedule your appointment to avoid any injuries. A: Yes, you can! The washing team will require a empty parking spot in close proximity to your building (30 metres or less) and on the same side of your windows. A: It's no problem for the cleaners to rinse the exterior surfaces of your windows as long as they are free to pass your front gates. And if blemishes have landed on your inside surfaces as well, just tell us and we'll conduct a free key pick-up and delivery. A: We will immediately inform you about the cause of the expert's delay and notify you once he appears near your building. Q: Can you refresh PVC window components? A: Yes we're certified to clean any type of casement or window part. In addition, every PVC or UPVC frame or sill will be polished at no extra cost! With our window cleaning in Brockley, you get a quality clean of your sash windows, skylights, conservatory roofs, French doors, and other glass surfaces at fair rates. We will even offer a free of charge treatment of all PVC & UPVC ledges and frames! For a full list of our prices, please check our price table below. 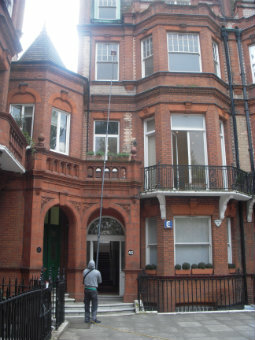 We've created our window cleaning in Brockley with flexibility in mind. As a result, our service is now regularly booked by business and residential customers alike. Let's review our window washing options on offer. With our external cleaning, you can effortlessly polish the panes of any building with four or less storeys. The seasoned adepts will show up in a cleaning caravan. The window cleaners in Brockley will then attach a convenient water-fed pole to the van's water storage. The special filtrated water will be ejected through a brush-head installment at the pole's end under enormous pressure. When the water vanishes under the sun, your windows will stay smudge-free for weeks to come. For buildings above the fourth storey, we'll send experienced climbers for rope access window cleaning. Carrying proven ropes, cherry pickers, and ladders, they will evaluate and refresh any lofty commercial property over the course of one afternoon. Should you require risk appraisal reports, we'll gladly provide them for you. We also take our work very seriously and will follow all safety regulations. If your glass surfaces are smudgy on the inside as well, the cleaners can perform inside cleaning with ladders and squeegees. As we obtained more and more positive responses from our clients, the need for window cleaning in Brockley has noticeably skyrocketed in neighbouring areas. You can go over the areas we've included in the list below. Alternatively, get a free instant quote or order affordable window cleaning services Brockley SE10 online, through our web site.